1. Cut two identical hearts out of the brown paper bag. Glue them together - just use a thin strip of glue around the edges, and leave an opening at the top. 2. When the glue is dry, stuff a little bit of cotton or kleenex into the inside, just enough to give the heart a little roundness. 3. Unwrap 2-3 red Hershey's kisses. Flatten the wrappers. 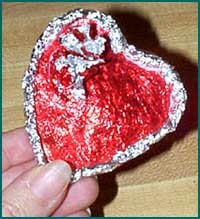 Using a flat brush, spread glue on the back of the wrappers and press them onto the heart shape. Wrap the edges around the heart. The back of your pin won't be very pretty, but nobody will see the back when you're wearing it! 4. Unwrap 2-4 silver Hershey's kisses. Flatten the wrappers and then fold/coil them tightly. Glue around the edges of the heart, end to end. 5. Decorate the middle of the pin any way you want. I crumpled up two red wrappers and glued them offset, they sort of look like fs. 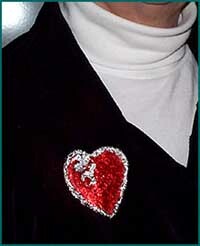 You could glue on little candy hearts or dried fs, or a picture of a heart... just about anything.